Thanksgiving is a wonderful time for all of us and our pets. However, it’s important to pay attention to your pets on this holiday to make sure that they’re staying safe. With all of the food, guests, and noise that accompany a large gathering, a pet can become overwhelmed. It’s very important to consider the safety of your pet when you are planning your Thanksgiving, and here are some tips to focus on. Leftovers and table scraps should be kept far away from pets. Eating turkey or turkey skin––even in small amounts––can cause a life-threatening condition in pets known as Pancreatitis. Fatty foods are hard for animals to digest. Aside from food scraps, there are some classic Thanksgiving foods which are actually toxic for your pet. These include caffeine, alcohol, raisins, salt, garlic, chocolate, and grapes. Additionally, yeast dough can cause problems for pets, such as painful gas and potentially dangerous bloating. As delicious as these treats are for humans, they are not safe for pets to eat, especially in large quantities. If you want to share a Thanksgiving treat with your pet, buy a pet-safe treat that is made just for them. If your pet is hungry and smells your delicious Thanksgiving feast, chances are that he will head to the trash for some scraps. 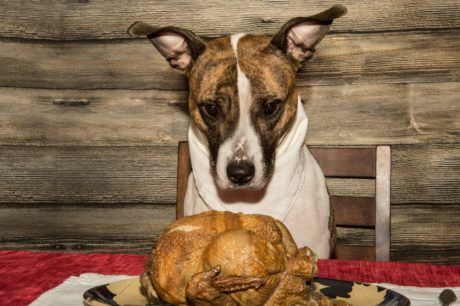 Scraps or other bits of the feast, while delicious, are not safe for consumption by pets.. Turkey bones and carcasses can also be deadly for your pet as there is a risk of choking. With all of the holiday commotion going on, it can be easy to forget to monitor your trash; so, be sure to cover the trash completely and to move it outdoors for the safety of your pet. It’s a good idea to create a very specific place where your pet can stay during Thanksgiving. Introduce your pet to the location beforehand to help them get comfortably accommodated, so that they know that they can always return to this spot if things get too busy. The noise and activity levels in your home during Thanksgiving can quickly become overwhelming for any pet. This quiet haven will be a great spot for your pet to relax while you enjoy spending time with friends and family. While your guests are entering or exiting your home, be sure to keep watch over your pet. Your pets can easily slip out the door and become lost. Pay extra attention to your pets, and let your guests know to watch out while opening and closing the door! Even the most social pet might become overwhelmed by Thanksgiving festivities. By taking these precautions and being sure to monitor your pet, you can help them to have a safe and happy day as well. If you have any questions about how to safely celebrate with pets, please give us here at Options For Animals a call at 309-658-2920 today!